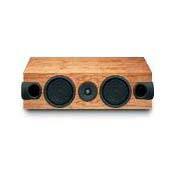 Two way bass reflex center channel speaker with seperate chambers for the midrange and tweeter. I have tried about 50 different center speakers, Linn AV 5120 definitely the best center speaker. Close your eyes, among those over $1000 center speakers, you pick up the best of nature sound center speaker, that is Linn AV 5120. 10 out of 10 times, I pointed out Linn. You will be happier if you have this one. It is not the money issue. It is the quality issue. the Av5140 speakers. The 5120 has great Clarity without being Harsh. Clarity, expansive presentation, well-made. Integrates smoothly into the Linn 51 system. It's does take up a bit of room. I am using this remarkable center channel in a mostly Linn AV51 system. The speaker has clarity and power. Everything sounds clean, clear and enveloping. Voices are reproduced with a naturalness that isn't often found. This unit replaced a KEF Reference 100 center channel which was also clean sounding but lacked the ease and expansiveness of the Linn. By "expansiveness" I mean that this speaker throws a very wide and tall stage. As could be expected it blends seamlessly with 5140 main speakers and Uniks surrounds. I have them bi-wired with Linn K400 cable which does make a difference, typical "lamp cord" sucked the life out of the 5120. For someone looking for a smaller Audio video setup, I would imagine that three 5103s plus small surrounds would offer a very involving alternative to using large floor standing speakers. Cherry finish is beautiful! Upgradeable, incredible value, musical, accurate. Speaker finish might be a little delicate. Truly one of the best center speakers I have ever heard. I first ran them passive for about a year, until I can afford Linn AV5105 power amp. For the last three years I have been running my AV5120 in active mode. Again incredible improvement. One thing that really draw me to Linn AV product line is the fact that you can upgrade as you go. Integration with Linn's AV5140 L/R is absolutely fantastic, exceptional, perfect. No wonder Stereophile Guide to Home Theater select as platinum award winner two years in a row. I also auditioned Revel and Snell. Based on price and value I could not get pass Linn. Another choice would have been Revel but at 3x the price it was not worth it to me. Power handling, sound quality. Upgradeability to Aktiv mode. Price a bit heavy. I bought new for $850 after heavy discount for labor trade to dealer. Major upgrade for me. Was using a Tukan in center (as well as rear channels). Have tri-amped Aktiv LINN AV-5140's as main channel speakers. Audio section is all LINN. Theater is mostly Rotel. Really like this center channel. I run it in "full range" mode from my Rotel processor. It is being fed by a 110w x 5 Rotel power amp. Recommend to anyone who wants beatiful sound from their theater system. Clean, natural reproduction of male and female voices. I listened to the 5120 today and was extremely impressed with the natural sound of the voices being reproduced through this center channel. I was really impressed with the lack of tonal influnces that tend to color the sound of the recording, that so often present in most of the center channels that I have heard over the past year that I have been auditioning home theater systems. At no time did the sound take on the nasal quality that is present in so many center channel speakers. Even though this speaker has two ports promenetly placed on either end of the front of the cabinet, I never felt as though the port was pushing sound at me, or creating a muddled effect, that is often caused by the inherent delay caused by the internally directed/reflected sound caused by the rebound of the BACK of the speaker diaphrams as it mixes with the sound being generated by the front of that same diaphram. I hope that you will notice that I always state "I" when describing what I heard, because I know that the sound, and the appreciation of the sound of a speaker is for the most part a subjective opinion. With this in mind, I will say that this center channel is, in my mind and to my ears, the best sounding and most theater like sound that I have had the pleasure, or misfortune, to audition. At this time, this center and the rest of the Linn speaker collection are at the top of my list for my home theater system!